A 32 tae 33-year auld Pedro Álvares Cabral in an early 20t-century pentin. Na contemporary portraits o Cabral are kent tae exeest. Pedro Álvares Cabral[upper-alpha 1] (European Portuguese: [ˈpeðɾu ˈaɫvɐr(ɨ)ʃ kɐˈβɾaɫ] or Brazilian Portuguese: [ˈpedɾu ˈawvaɾis kaˈbɾaw]; c. 1467 or 1468 – c. 1520) wis a Portuguese nobleman, militar commander, navigator an explorer regairdit as the discoverer o Brazil. Cabral conductit the first substantial exploration o the northeast coast o Sooth Americae an claimed it for Portugal. 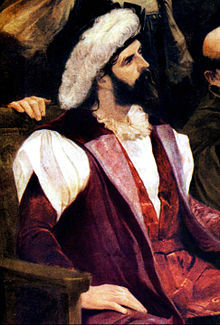 ↑ His name wis spelled during his lifetime as "Pedro Álveres Cabral", "Pero Álvares Cabral", "Pedr'Álváres Cabral", "Pedrálvares Cabral", "Pedraluarez Cabral", amang ithers. This airticle uises the maist common spellin. See McClymont 1914, p. 1, Tomlinson 1970, p. 22, Calmon 1981, p. 44, Capistrano de Abreu 1976, p. 25, Greenlee 1995, p. 190. This page wis last eeditit on 25 Mairch 2017, at 17:38.